Chukku kappi / dry ginger coffee is a very popular South Indian coffee which is good for cold and cough. Yes, we do love easy and homemade remedies for cold and cough. It is very difficult to cure cold and cough without medication. But it is very easy to get relief from the cold and cough. All you have to do is to follow this simple home remedy to get quick relief from the same. 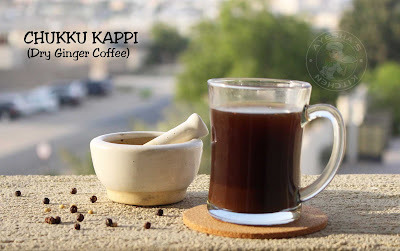 Dry ginger / chukku, black peppercorns, coriander seeds, palm jaggery, tulsi leaves or holy basil leaves and coffee powder are the ingredients required for making this awesome drink. Moreover, it gives relief to the throat infection and helps to open the nasal blocks caused due to cold. This amazing drink gives quick relief but must be continued for 2 or 3 days. So you can prepare this drink in bulk and can keep refrigerated for 2 or 3 days. So that you can easily reheat it and serve hot. If so, skip adding jaggery and instead you can add sugar or honey while serving. As my mom know the medicinal benefits of dry ginger, she used to add it to most of the dishes. Apart from its taste, dry ginger or sukku cures throat infection, headache, indigestion, stomach pain, cold, cough, asthma, acidity etc. Coriander seeds, in Ayurveda it is often recommended for stomach ailments, better digestion, curing cold and flu etc. Holy basil or Krishna tulsi is one of the best medicinal plants that has endless miraculous medicinal values. It is best for asthma, fever, lung disorders, headache, immunity etc. 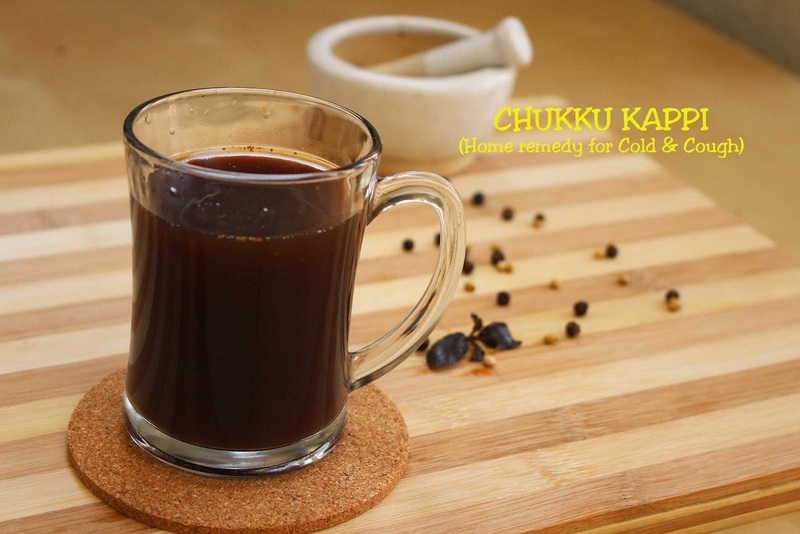 So have this hot coffee during winter on those rainy days and stay away from cold and cough. (Also please check my adalodakam omelette recipe which is also a delicious home remedy for cough. Adalodakam, which is also called Malabar nut, is used in treating respiratory disorders in Ayurveda). Crush the dry ginger and peppercorns using a mortar and pestle. Add it to the saucepan. To the same vessel, add coriander seeds along with 2 cups of water. Allow it to boil. Let it boil for 5 to 8 minutes. Then add basil leaves, coffee powder and jaggery (optional). Again boil well (5 minutes) over medium flame and once done. strain it. Discard the solid. Serve hot. Here is the video chukku kaappi.